(Los Angeles, Calif.) - Nik Wallenda, "The King of the Highwire" is back at it again. This time, he is heading to the historic "Windy City" of Chicago to attempt his most audacious and challenging tightrope walk yet. And like the legendary Wallenda family tradition, he will do it all without a net or harness. SKYSCRAPER LIVE WITH NIK WALLENDA will air live around the world in over 220 countries beginning at 7 PM ET/4 PM PT, Sunday, November 2 on the Discovery Channel. The live event will be hosted by NBC News' Willie Geist, Natalie Morales and The Weather Channel's Jim Cantore. In June 2013, Wallenda became the first person to ever successfully traverse the Grand Canyon on a tightrope. The live broadcast shattered ratings records peaking with 13 million viewers, making it Discovery's highest-rated live event ever; and generated 1.3 million Tweets, ranking it as the most social show across all broadcast and cable networks in the US. The special was also recently honored with an Interactive Emmy® for Multiplatform Storytelling for its companion website, which featured compelling video, 360-degree interactive views, backstage moments, real-time social updates and many other digital elements. "Discovery Channel delivers the most talked-about series and live events on television," said Marjorie Kaplan, Group President of Discovery Channel, TLC and Animal Planet. "We are excited about shifting from the natural backdrop of the Grand Canyon to the urban environment of Chicago. It is an iconic American city that presents a number of extreme conditions and challenges that Nik has yet to attempt on such a grand scale." Dozens of cameras will be positioned across the city and on helicopters - rolling as Wallenda attempts this nail-biting, two part walk at night time in one of the windiest sections of Chicago. With unpredictable weather conditions, the tightrope crossing will present countless obstacles. 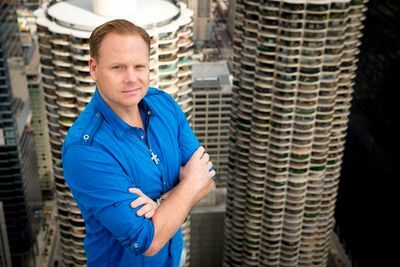 For the first part of the tightrope crossing, Wallenda will walk further than two city blocks - uphill rising to a 15-degree angle - from the iconic Marina City's west tower to the Leo Burnett Building at more than 50 stories high above the Chicago River. Not only will this be the highest skyscraper walk in the history of the "Flying Wallenda" family, it will be the first time that he has ever attempted it at such a steep angle. The second part of the walk will span from the Marina City's west tower to the east tower. "This is going to be the most incredible tightrope walk of my career," Wallenda said. "I can't think of a better city to do it. I have fond memories of spending time performing in Chicago and the Midwest with my family. Besides, it's the ‘Windy City' and there's nothing like doing this during winter in Chicago. That's a challenge for me and I love to push myself to do things that most people think are impossible." A seventh-generation member of famed "Flying Wallenda's," Nik began performing with his family as a toddler and made his first professional tightrope walk at just 13 years old. He hopes this latest feat will inspire others to go after their dreams and dedicates it to his family, particularly his great-grandfather, the legendary Karl Wallenda, who died after falling from a tightrope in Puerto Rico in 1978. Wallenda will be joined in Chicago by his wife and three children, his close friends and an engineering team led by his father Terry Troffer. "I'm always looking for the next major hurdle and doing something that the world has never seen," said Wallenda. "I want my family to be there to see history in the making. And feel comforted knowing that they'll be praying along with me." SKYSCRAPER LIVE WITH NIK WALLENDA is produced by Peacock Productions for Discovery with Gretchen Eisele, Colleen Halpin, Knute Walker, Benjamin Ringe and Betsy Wagner serving as executive producers. Sharon Scott is President and GM of Peacock Productions. Howard Swartz serves as executive producer for Discovery. Other Executive Producers include Nik Wallenda, David Simone, Winston Simone and Shelley Ross. To learn more, go to Facebook at Facebook.com/discovery or Twitter @Discovery.